Over 100 anglers are expected to travel to Decatur for the 2nd annual American Dream Tournament where the winning team receives an all-expense paid guided trip to Japan or a $3,000 cash prize. Organized by professional angler, Kota Kiriyama, the tournament will take place on Wheeler Lake December 3, 2011. Ingalls Harbor located at 802 Wilson Street NW will host the takeoffs and weigh-ins. For the past four years, Kiriyama has hosted the American Dream Tournament in Japan where the winning team receives an all-expense paid trip to the BassCat Invitational to experience American bass fishing. In 2010, the American Dream Tournament was held for the first time on Wheeler Lake attracting 42 teams from across the United States. Jason Meninger of Gainesville, Georgia, grabbed the first place prize at the inaugural tournament. The prize for first place is $3,000 cash or an all-expense paid guided trip with Kiriyama to Japan to experience the country’s culture, history, and food and to fish on Lake Biwa. Cash prizes are also up for grabs for the biggest bass and the top ten teams. The tournament is open to all anglers throughout the United States. Registration is a $150 team entry fee (one or two persons per boat) with $25 of the registration fee going to the American Red Cross Disaster Relief Fund to help the victims of the April 27 tornado outbreak in Alabama and the people of Japan with their recovering efforts from the 8.9-magnitude earthquake and tsunami that followed in March, 2011. Kiriyama is a six-time Bassmasters Classic qualifier, champion of the 2008 Bassmaster Elite Series Tournament at Lake Erie, New York, and a top international angler. For more information, visit www.kotaamericandream.com or follow Kiriyama’s blog at ninjatacklebox.com. Set for November 28-December 3, 2011, over 500 student-athletes and coaches will travel from the United States and Canada to Decatur, Alabama to compete in the 2011 National Association of Intercollegiate Athletics (NAIA) Women’s Soccer National Championship. The 15-game tournament is estimated to pump more than $580K into the Decatur and Morgan County area where local restaurants, hotels, and retail stores will all be directly impacted. All games will be played at the Jack Allen Recreation Complex located at 2616 Modaus Road SW in Decatur and are open to the public. Game times are 10 a.m., 1 p.m., 4 p.m., and 7 p.m. on Monday, Tuesday, and Wednesday; 1 p.m. and 3 p.m. on Friday; and 5 p.m. on Saturday. No games are scheduled for Thursday. A kick-off banquet for all competing teams is set for Sunday, 6 p.m. and a Semifinalist Banquet will be held at noon on Thursday at the new Ingalls Harbor Indoor Pavilion. Admission is free. Parking is $10 per day/per car and $20 per day/per bus or an all-tournament pass is available for $30 per car or $60 per bus. Parking passes will be available at the complex entrance. The NAIA Women’s Soccer National Championship in 2011 will mark its third time in the state of Alabama. The Jack Allen Recreation Complex hosted the prestigious event in 2009 and 2010. NAIA is the governing body for athletics programs at its nearly 300 colleges and universities throughout the United States and Canada. The long-held mission of the NAIA is to promote the education and development of well-rounded students and productive citizens through intercollegiate athletics. For more information on NAIA and the women’s soccer national championship, visit www.NAIA.org. Alabama Tourism Department Director Lee Sentell and Decatur tourism icon Squee Bailey were two of those honored by the Decatur-Morgan County Convention & Visitors Bureau (DMCCVB) and the Decatur-Morgan County Hospitality Association (DMCHA) during the annual Tourism Breakfast and Awards Program here on Thursday at the Holiday Inn and Suites. 3M was recognized by the Hospitality Association as the 2011 Top Corporate Award Winner for generating 4,159 hotel room nights in the Decatur area during the past year. theUniversity of Alabama-Huntsville Charger Chillout Softball Tournament was named “The Good Neighbor” of tourism winner, and Country Inn and Suites Sales Director Anthony Viator was named the Young Professional of the Year. A new African-American heritage video produced by the DMCCVB entitled “Lift Every Voice and Sing” was also debued at the meeting and a new :30 second commercial promoting the Year of Alabama Food that includes Decatur’s Big Bob Gibson Bar-B-Q was also shown. The Decatur-Morgan County Convention & Visitors Bureau is a not-for-profit organization promoting tourism and economic growth in Morgan County. The Decatur-Morgan County Hospitality Association works to promote a better understanding of the hospitality industry, to represent the interests of the industry, and to promote good fellowship and free exchange of ideas. Members of the Association include hotels, restaurants, shopping venues, attractions, and festivals. The Gilmer Blackburn Legacy Award was created last year as a means of recognizing an individual who has shown a long lasting and permanent contribution to the industry over the years and has helped change the tourism landscape of Morgan County. It is named in honor of of the late Mayor Blackburn who was instrumental in developing the foundation of the tourism industry here. As the first recipient of the Blackburn Legacy Award, Sentell is considered one of the most respected tourism professionals in the state of Alabama and the Southeast. Before working professionally in the tourism industry, he worked for 12 years as a reporter, business editor and later city editor at the Decatur Daily. He was the first paid touris staff member ever hired by the Decatur Chamber of Commerce, which led to the establishment of the Decatur-Morgan County Convention & Visitors Bureau. He was inducted into the Alabama Tourism Hall of Fame in 2000 and has served as president of the Alabama Travel Council and as chairman of the Alabama Bureau of Tourism and Travel Advisory Board. Sentell was appointed by Gov. Bob Riley in 2003 to serve as the Director of the Alabama Tourism Department and under his skilled leadership, the Alabama Tourism Department won several awards for its marketing campaigns from the Travel Industry Association of America, the National Council of State Tourism Directors and the Public Relations Council. The department has also been named Tourism Organization of the Year for three years in a row by the Southeast Tourism Society, and has won the Odyssey Award for 2008 from Travel Industry Association for the Year of Alabama Arts. Bailey, honored with the Julian Walker ‘Mr. Tourism” Award, has been involved with the local tourism and travel industry for the past 20 years. She serves as the leader of Decatur’s Saturday Walking Tours, a welcoming guide for tour groups, and was the developer and innovator behind the Familarization Tours for front-line hotel and attraction employees. Bailey also serves on the Downtown Merchant Committee, on the Old State Bank Board, is a liaison to the Christmas Tour of Homes Committee, and is a past winner of the Alabama Mountain Lakes Tourist Association Legacy Award. The Young Professional Award is presented annually in honor of Layna Sorrell, a long time tourism employee who truly had a passion for the tourism industry. The “Young Professional of the Year” is presented to the person who has been in the tourism industry less than seven years and has exhibited extraordinary leadership skills and initiative associated with their position. As this year’s winner, Viator was noted for his enthusiasm, attention to detail and extraordinary efforts he goes through to insure his guests enjoy their stay in Decatur. The Event of the Year winner, SoulStock, moved to Decatur in 2009 and is a two-day event featuring Christian music and worship. The free admission festival averages more than 20,000 visitors and is sponsored by churches, businesses, and individuals mostly in the surrounding communities. Due to its’ popularity, SoulStock will expand to a three-day event in 2012. “Good Neighbor” of Tourism winner, the UAH Charger Chillout Softball Tournament, attracts some 22 collegiate teams from eight states to Wilson-Morgan Park for three days of intense competition each February. The Chargers finished Number 2 in the country this year and were also one of five 2011 Easton “Team of the Year” Award Winners. International Paper-Courtland with 2,825 room nights,Daikin with 1,857 room nights, Wayne Farms with 1,692 room nights, Lockheed Martin with 1,505 room nights, CSA with 1,219 room nights and Alpha Pet with 1,208 room nights. Among the marketing and development programs instituted by the Convention & Visitors Bureau during this past year included a new Morgan County Outdoor brochure, sales materials for the new Ingalls Harbor Pavilion which opens next month, a new Civil War Geocaching trail and coordinating the docking of the Pickwick Belle Riverboat here this past summer. 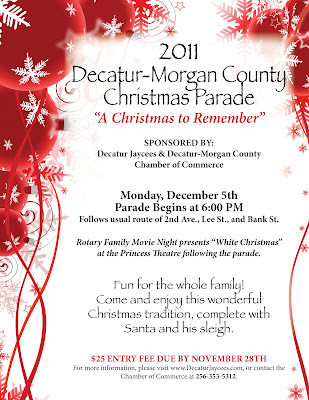 For information on special events and attractions in Decatur and Morgan County, contact the DMCCVB at 800.524.6181 or 256.350.2028; or visit its website at www.decaturcvb.org. The merchants of historic downtown Decatur are ready to spread holiday cheer and invites everyone to join in as the holiday spirit fills the air with its monthly 3rd Friday celebration. Along with festive holiday music, gift ideas, holiday decorating tips, and hot cider, the evening includes visits with the jolly old man himself. Set for Friday, November 18th, the block party officially kicks off at 5 p.m. There will be plenty of live entertainment, and various snacks and refreshments will be offered throughout the evening at many of the establishments. Briley Sandlin will be performing outside at Downtown Dawgs, Barb Carbon and Arrie Bozman will entertain the dinner crowd at Simp McGhee’s, and special acoustic Christmas music will be offered outside of Bank Street Antiques. Bring your holiday shopping list; many of the merchants will remain open until 8 p.m. providing a variety of gift ideas from stocking stuffers to that hard to buy for person. Store specials, giveaways, and discounts will be offered at selected retailers and restaurants including Albany Framing, Bank Street Antiques, Cottage House, Downtown Dawgs, Glee Interiors, Memi’s, Ruggiere…A Gallery, Sam Frank & Moore, Tallulah’s, The Paper Chase, and Trish Land. Local photographer Brandie Hatfield will be snapping complimentary pictures with Santa at Divas, Doodlebugs and Debutantes. Set up outside of The Paper Chase, RE/MAX Platinum Alabama will have “Operation Christmas Cards for Our Troops” where anyone can sign Christmas cards to be mailed to members of the Armed Forces. The Carnegie Visual Arts Center will offer a $5 admission to its Friday@5 featuring Cutting Edge: Paper Art by Michael Liv with a receipt from any downtown merchant. Participating streets in 3rd Fridays include 2nd Avenue, Bank, Market, Moulton, Grant, and Johnston Streets. For more information, call Ashley Ashwander at 256.355.8993. Due to inclement weather predicted for Wednesday, the Rick and Bubba Turkey Toss has been rescheduled for Thursday, November 17th. The event will take place from 6 to 10 a.m. at Academy Sport + Outdoors in Decatur, and along with flying turkeys, reality stars from “Rocket City Rednecks” will make a special guest appearance bringing with them their own hand-made contraption to launch a turkey into the air. National Geographic Channel’s latest reality series “Rocket City Rednecks” features self-proclaimed rednecks from Morgan and Madison counties. Each episode shows how they combine redneck ingenuity with engineering and physics to solve real-world problems. Travis Taylor, Charles “Daddy” Taylor, Michael “The Kid” Taylor, “Pistol Pete” Erbach, and Rog “The Sidekick” Jones will be in Decatur where they will launch a frozen turkey using the trebuchet they built for the “Hillbilly Armageddon New” episode that aired on October 5, 2011. Academy Sport + Outdoors located in Decatur was chosen by the general public to host the 2011 Rick and Bubba Turkey Toss from an online voting contest on the Rick and Bubba website in early October. The annual competition serves as a fundraiser for a local charity while determining who can throw a frozen turkey the farthest where $5K in Academy Sport + Outdoors gift cards are up for grabs. The nationally syndicated radio hosts of the Rick and Bubba Show will broadcast live providing a play by play action of the competition to their listeners from 6 to 10 a.m. in the parking lot of Academy Sports + Outdoors. One by one, contestants line up to see who can throw the frozen turkey the greatest distance. While the wildly popular contest determines who can throw the farthest, it also raises money and food for a local charity. Those interested in participating must donate a non-perishable food item or cash. Neighborhood Christian Center of Alabama will be on hand to accept donations. The 2010 event took place in Montgomery where the winner in the male division threw a distance of 121 feet with the female winner taking honors at 76 feet. Divisions include men’s, women’s, military, kids (12 and under), and high heels (women only). Prizes, totaling $5K in Academy Sport + Outdoors gift cards, will be awarded to 1st, 2nd, and 3rd places in each division. For more information on the Turkey Toss, call Eric Herrera with Academy Sport + Outdoors at 281.646.5422. Rick & Bubba are heard by over 3.5 million listeners every day on 60+ radio stations across the United States. For more information, visit www.RickandBubba.com. The Alabama High School Athletic Association (AHSAA) will hold its 39th annual State Cross Country Championship at the Oakville Indian Mounds Park on November 12, 2011. Hosted by the Jesse Owens Runners’ Club, approximately 1,500 elite runners from across Alabama will take part in the race to be held on the championship course located on the grounds of the Oakville Indian Mounds Park and Museum. The first race begins at 8:30 a.m. According to Coach Stan Johnson of the Jesse Owens Runners’ Club, this is the Club’s tenth time to host the state event. The championship course is great for spectators who want to witness competitive racing from the sidelines. Admission is free. A small parking fee will be charged daily. Oakville Indian Mounds and Park is located approximately 8 miles south of Moulton on Alabama Highway 157 and 1/2 mile from the Jesse Owens Memorial Park. For more information on the championship course, visit www.alabamahighschoolrunner.homestead.com and click on “Oakville Indian Mounds Cross Country Course”. For more information on AHSAA, visit its website at www.ahsaa.com. The Carnegie Visual Arts Center presents the exhibit Cutting Edge: Paper Art by Michael Liu, November 15, 2011 through January 14, 2012. The solo exhibit includes pieces of art which the artist creates utitilizing his own intricate paper cutting techniques, and his detailed portraits in charcoal and graphite on paper. Michael Liu was born in Kweishan, Taiwan in 1962, the grandson of the city’s mayor. At the local high school he was both an avid artist and track star, winning several national medals. In 1985 he graduated from the College of Engineering in Kaohsiung and began his military service. After working as an engineer for several years, he returned to his early interest in art and opened galleries in Taoyuan, Taiwan, and Evadon, Switzerland. At first he handled only works by other artists, specializing in prints from the Yunan School, but then he began to produce his own art both in charcoal and acrylic. At this time Michael also worked actively as an interior designer, often providing the art that his clients needed. Michael’s art is self taught and reflects his personal interests and his experiences in both the Chinese culture in which he grew up and the Western culture which he experienced as an adult. Using his detailed and realistic style he does portraits in charcoal and in pencil. Often these are interesting people and sometimes animals, especially dogs. Since 2008 Michael has explored an interest in paper cutting, an art form that has roots in both Chinese and Japanese art. In the US we may think of the cut-paper silhouettes that were popular in our Federal period as an early antecedent, but anyone who has seen Michael’s cut paper portraits knows that he has pioneered a new approach to capture personalities in three dimensions. Today, Michael divides his time between Taiwan and Alabama. His bicultural life is expressed in his signature which overlaps his western name with his Chinese personal stamp. Michael creates art as inspired and by private commission. 5 PM- 7 PM each evening. The November Fri@ 5 will also be the artist reception with Michael Liu as the guest of honor. Appetizers and complimentary beverages will be served. Food will be provided by friends of the artist on November 18th and courtesy of Albany Bistro on December 16th. Suggested admission is $5 for Carnegie members and $15 for non-members. Attendees should be 21 years of age. On December 2nd from Noon to 1 PM, Micheal Liu will demonstrate his intricate cutting techniques he uses to make his unique art. He will show samples of his work and answer questions about his art and his inspirations. The demonstration is free but reservations are encouraged because of limited seating. Call 256-341-0562 to make reservations. Hi-res images available by request. Regular museum hours are Tuesday - Friday, 10 AM - 5 PM and Saturday, 10 AM - 2 PM. The Carnegie is located at 207 Church St. NE Decatur, Alabama 35601. The Decatur Alabama Kennel Club and The Huntsville Kennel Club come together each November for the largest area dog shows licensed by the American Kennel Club (AKC). Set for November 10-13, 2011 at the Morgan County Celebration Arena located on Highway 67 East in Decatur, dogs ranging from puppy to the most experienced show dog compete for the best in show at the annual Cotton Cluster Dog Shows. Over 1,200 dogs from all over the United States registered and competed last year. Shows are held daily and spectators are welcome to attend. On Thursday, the Huntsville Kennel Club will award a $2000 scholarship for Auburn University College of Veterinary Medicine to a student from northern Alabama. Event organizers encourage anyone considering the purchase of a purebred dog to attend the Cotton Cluster Dog Show and talk to exhibitors about their breed. Admission is free. A small parking fee of $5 will be charged daily. For show times and more information, visit the Huntsville Kennel Club on Facebook or visit the Decatur Kennel Club’s website at www.DAKC.org. For additional information on the American Kennel Club, visit www.akc.org. Where: 2nd Avenue & Gordon Dr. to Lee St. to Bank St. & Church St.
Where: Bank St. & 2nd Ave. Event: American Idol's Bo Bice Live!